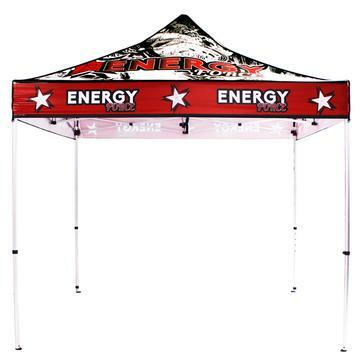 Casita canopies serve as an excellent way to provide shade for outdoor events. The graphic is printed on special water-resistant material and dries immediately during the even more special UV-cured printing process. Finished prints appear shiny and vivid and have added protection against natural elements. Wind Speed Rating: 20-28 mph. This canopy is a standard 10 ft. x 10 ft. size with five different heights ranging from 10.5 ft. to 11.25 ft. tall. Telescopic legs snap into place. Each hex leg is 40 mm thick. Wind Speed Rating: 20-28 mph This canopy is a standard 10 ft. x 10 ft. size with five different heights ranging from 10.5 ft. to 11.25 ft. tall. Telescopic legs snap into place. Each hex leg is 40 mm thick. Warranty: Lifetime on frame One (1) year on graphic. The graphic is printed on special water-resistant material and dries immediately during the even more special UV-cured printing process. Finished prints appear shiny and vivid and have added protection against natural elements. Frame includes a wheeled travel bag.